A vision without mission is dreaming. A mission without vision is toil. A mission with a vision is the hope of the world. The Finnish White Ribbon Union, founded in 1905, is a Christian values-based, national organization working against substance abuse. Its members are women who identify with the principles of the Union. As an organization, we support individuals and families in finding a balanced and healthy lifestyle, as well as call our citizens to work for a substance-free society. Our work is aimed at both men and women. The objective of White Ribbon work is to offer various forms of support to people who have problems. Our languages of service are Finnish, Swedish and English. The White Ribbon movement was founded in North America in the 1870’s. Over the following decades it expanded into an international movement with its current members residing in over 50 countries. The international organization presiding over national unions is called the World´s Woman´s Christian Temperance Union, WWCTU. The White Ribbon movement entered Finland in 1896 when the first local association was founded in Turku. Some of the early influential personalities were the Finnish women’s rights advocate Alli Trygg-Helenius and the Union’s first travel secretary Maria Stenroth, also known by her author name Marja Salmela. Activities in the early years focused on helping the most vulnerable groups in society, i.e. disadvantaged women and children. Shelters and half-way houses for women as well as children’s homes for boys and girls were founded in many parts of the country. Youth clubs were developed as a tool for working with youth. The Finnish White Ribbon union played an influential role in obtaining the first female police officers in Finland. White Ribbon work has always been wide-ranging in the Finland. From the beginning, the White Ribbon movement has been active both in association with the Lutheran church and as an ecumenical movement. Adhering to democratic practices and laws has been essential in maintaining a spirit of tolerance in societal connections. The democratic tradition was early on rooted into the Union by some of the first Finnish female members of Parliament and White Ribbon sisters, e.g. Aleksandra Gripenberg and Hedvig Sohlberg. The international White Ribbon movement battled strongly for women’s right to vote, as did the Finnish White Ribbon sisters in support of a common and equal right to vote. Today our work is centered around families, personal discussions with people needing support, supportive group activities, and maintaining a student home for women in Helsinki. Since 1909, the Union publishes a magazine called Valkonauha (The White Ribbon). 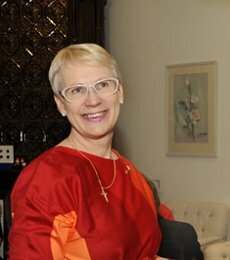 One of the capital area local associations, Greater Helsinki White Ribbon Association, maintains a retirement home named Liisankoti for women recovering from substance abuse. The Union has nine local associations in eight cities: Helsinki, Hämeenlinna, Kuopio, Lappeenranta, Mikkeli, Oulu, Tampere and Turku.